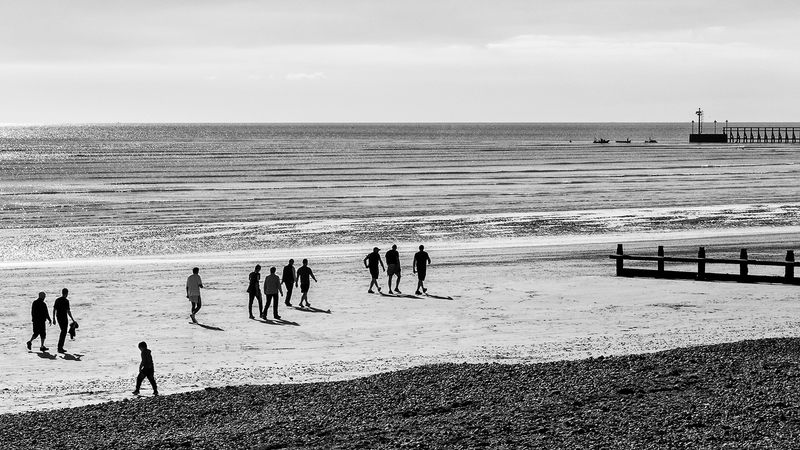 The tide was out, and there were people on the beach, simply walking, in groups. I took a few shots as a I walked parallel to them. Shooting groups is never easy – trying to avoid overlapping figures, people with oddly placed legs or absent arms. This image got most things right and it had something extra – a figure going the wrong way! Does that interloper add something or should he/she be cloned out? There are arguments either way but on balance I think that extra figure adds a tension to the image the is beneficial. What do you think? Do add a comment. This entry was posted in Black & White, Coast and tagged beach, Beach scenes, Black and White Photography, coast, Littlehampton east beach, Photography. Bookmark the permalink. IMO interloper adds interest! Hence your question! Thanks Sue. My wife thinks that interloper’s legs spoil the picture – I can see what she means. Well, I still think the tension works…. It looks like a scene from the 1920’s. But I don’t like the chap heading in the wrong direction. I bet he doesn’t queue properly either. Thanks Robin. That man goes against the grain – a symbol of discontent? I remain in two minds about that chap – my wife says his legs aren’t right! I definitely like the opposite-direction walker. Also the balance of walkers and dark elements on the right of the frame. Thanks Linda. Some like that figure and some don’t. I’m still not convinced he works. I think I will enter it into one of our Camera Club competitions next year and see what a judge thinks – but he too is just yet another personal opinion. I agree with all of your other commenters, Andy: I like the fellow heading in the wrong direction, and I bet he doesn’t queue properly either. 🙂 Love both your framing and your treatment of this image! Thanks Heide. That fellow is a disruptive force! It’s interesting that you and some others refer to the lone figure walking in the “wrong” direction. What makes it wrong? And what makes him an interloper? Could it be that he’s the one headed in the right direction, and the others are wrong? Or might it be that right and wrong as categories need not be applied to the image at all? I love that single walker. His presence suggests stories, and questions. If I were given a choice to follow the group or to follow the individual, I’d go with that lone walker. He’s ‘wrong’ because he’s going against the grain. He might be walking in the right direction and everyone else is going the ‘wrong’ way. He’s a symbol of the lone prophet ignored by the masses etc. He’s disruptive and he’s got people debating – like vs don’t like. I am still ambivalent myself as to whether his position ‘works’ in the composition or not. But wouldn’t it be just as wrong to clone him out of the image? Both metaphorically and literally, that’s what’s happened to too many people over time. Of course, now there are programs that can rid us of pesky tourists in landscapes and such in a flash, so I guess the practice is considered quite acceptable, and it’s my own prejudices in the matter that are showing. Can you keep a secret? There was a second person heading in a different direction – ugly stance – so therefore removed. I have been known to do that sort of thing, occasionally. Can you hear me laughing? We never know, do we? Excellent capture, Andy…and wonderful treatment in black and white, too. Many thanks Scott. On a day like this, there was no really right direction to walk although given the choice I always like to walk towards the sun – which is the direction of travel chosen by the masses!